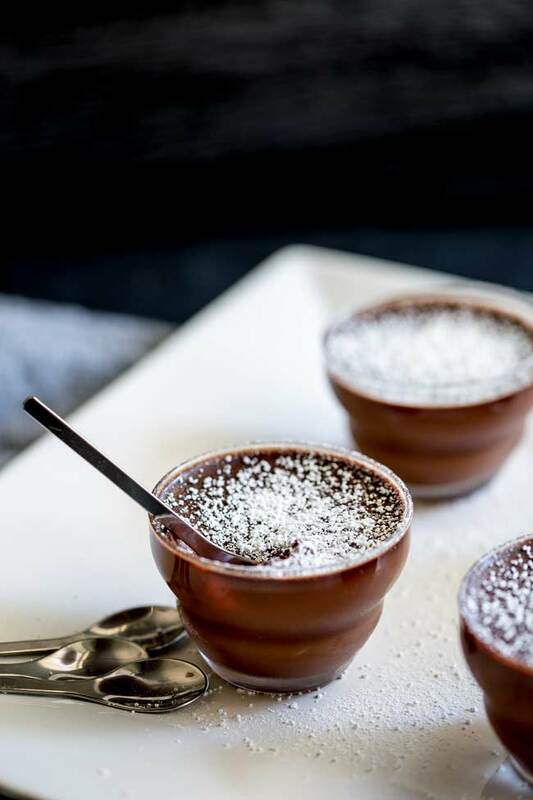 These chocolate mousse pots are the perfect way to end a meal. Sweet, but not sickly, they are a rich and decadent dessert that is prepared in advance. That makes them perfect for entertaining! Plus they are so simple to make. 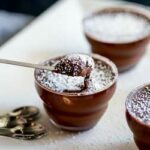 I promise these Delicious, Rich and Simple Chocolate Mousse Pots will instantly earn a spot in your recipe repertoire. These chocolate pots may look small but they are big on impact. They are really rich so a small pot is all you need. When you start the recipe it really won’t look like much, but a small chocolate pot at the end of a meal is enough. What chocolate is best for mousse? That the quality of your chocolate mousse depends on the quality of your chocolate. If you buy the cheap compound chocolate your mousse will suffer. The best quality chocolate is expensive and I like to save that for eating! So to save on expense but without compromising on taste I like buy medium quality chocolate chips. I find semi-sweet chocolate is best. For me the bittersweet chocolate is too dark and bitter. Plus if you use semi-sweet chocolate then you won’t need much extra sugar. But if you are a lover of really dark bitter chocolate then sub in bittersweet chocolate, rather than leaving out the sugar. The brown sugar in these chocolate mousse pots gives them a touch of toffee richness. To make it easier I dissolve the sugar in the alcohol first, but to be honest it will dissolve in the hot cream anyway! What liquor can I add to my chocolate mousse? Plus if you are serving kids then just omit the alcohol and add extra cream instead. Can Chocolate Mousse be made ahead of time? These chocolate mousse pots need at least 4 hours to set. But you can make them the day before and then leave them covered in the fridge until you need them. They will need to come to room temperature before you eat them as they are so rich and dense, they need to soften slightly. Dust them with the powdered sugar just before you serve. Tips for making this recipe for Chocolate Mousse Pots. 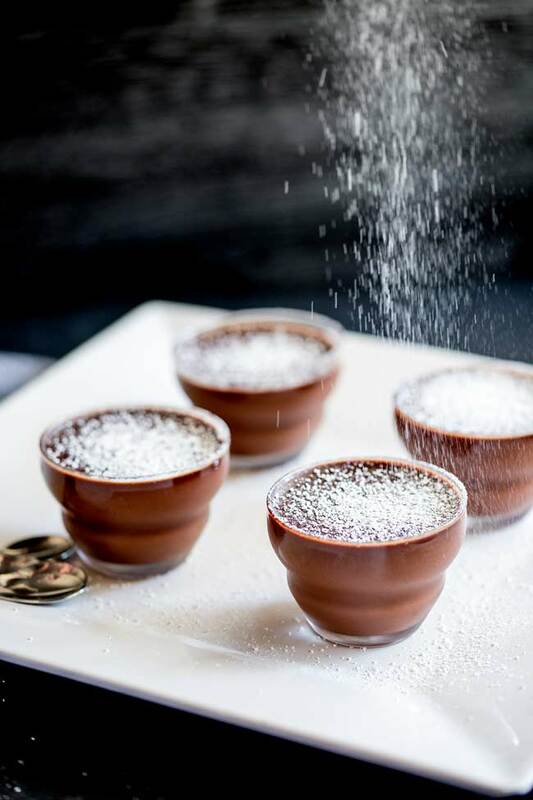 These simple chocolate pots are quick to make, but one step that can’t be skipped is allowing the cream to cool slightly before you add in the other ingredients. Otherwise you risk splitting the chocolate or scrambled the eggs and both of these would just be disgusting! Make these ahead of time, pop them in the fridge, remove them when you sit down for your main course and dust with powdered sugar (icing sugar) just before you serve them. Maybe add an almond biscuit? Store bought is more than fine, I mean you made dessert form scratch! Although I do have a recipe coming soon for some almond thins that would work fabulously here. 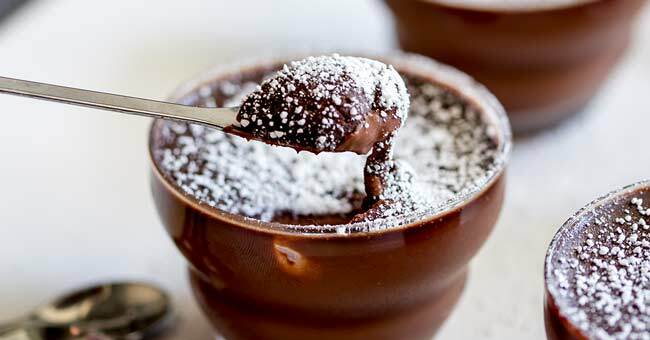 These chocolate pots are the perfect way to end a meal. Sweet, but not sickly, they are a rich and decadent dessert that is prepared in advance. That makes them perfect for entertaining! Plus they are so simple to make. Pour the heavy cream into a small saucepan and place over a medium heat. Heat the cream until it is almost boiling, but don’t let it boil. Remove the cream from the heat and set aside for 1 minute to cool slightly. Whilst the cream is cooling add the brown sugar to the amaretto and stir to dissolve. Add in the chocolate chips to the hot cream and stir until they have melted. Add the amaretto mixture to the chocolate, along with the egg yolks. Mix well together and then lastly stir in the butter. Pour the mixture into small pots and chill for 4 hours or until needed. Instead of amaretto, you could use dark rum or an orange liquor. To remove the alcohol use extra cream instead. MMMMMM Chocolate!!! This chocolate pot recipe has been with me for most of my adult life!!! It is loosely based around a dessert I ate at a little french bistro in Chelmsford. Although there theirs was spiked with cognac! So rich, so packed full of chocolate flavour and so enjoyably dense that a small pot is enough to satisfy. The recipe it’s self is a mix up of chef recipes, notably Jamie Oliver and Tom Kerridge, plus a bit of my own love for amaretto and deep dark dense chocolate. If you are a regular reader (or even just someone who has browsed my recipe collections) you will know I am not a big dessert eater. Most times I say give me cheese and crackers over a dessert. But occasionally a dessert is required or craved. And if I crave dessert then it is nearly always chocolate! And I mean, when you crave chocolate you want chocolate. Which is what this Simple Chocolate Pot recipe has in abundance. For years it was my dinner party staple, so much so that people came to expect it. Which is a good and a bad thing! Reassuringly familiar is one things, but boring predictability is quite another!!!! 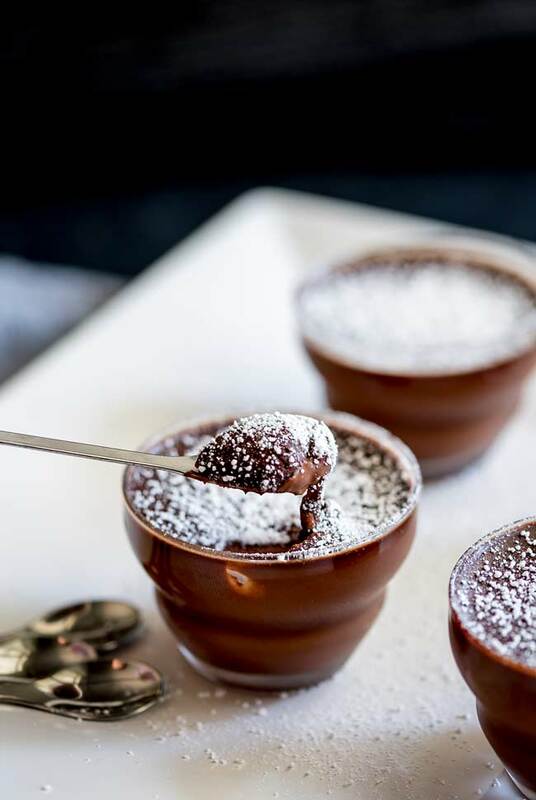 If you love food why not subscribe to my newsletter, I will drop you an email every now and then, just to say hi and send you a couple of recipes think you might love, like these Chocolate Mousse Pots. So dreamy. So decadent. Can’t wait to try these for my hubby’s birthday next week. These look utterly delectable, and I love the little bowls you’ve served them in. Beautiful! These are beautiful. I actually squealed a little when I saw the picture. It’s 6am right now, but I want one anyway! I love chocolate, and simple, and make ahead! This dessert looks just divine, and I can’t wait to try it. Oh my gosh, these are gorgeous! Perfect for New Year’s Eve! Yes! They are perfect for parties. 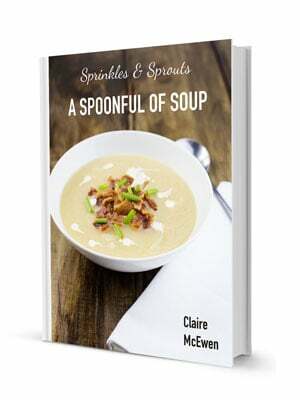 Nice and mouthwatering recipes. Thanks for sharing.